Bar Seal is an ISO/DIS 17712 & C-TPAT compliant, high security, bar and bolt security seal. 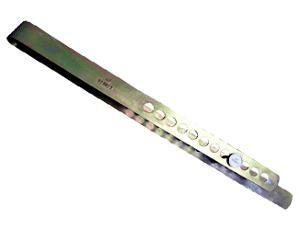 The high strength steel bar is 555mm x 35mm, with adjustable locking area and is supplied with a snap on, steel locking bolt (35mm x 11mm diameter) with matching sequential numbers. Used with containers and trailers for the additional security of high value goods, it is supplied in cartons of 25 seals at £6.00 each, with delivery within 2 working days.